Discussion for Design Article #8, available here. Discussion for Design Article #7, available here. Discussion for Design Article #5: Pony Powers. What kinds of powers do you like or dislike? Drawing Board / Re: Workshopping Shipwrecker CMC into ponies. Yes, I've noticed that when the grid gets really big, it's because someone chose not to destroy it when they had the chance. I used to play with a guy who would go out of his way to nuke the grid, so I was the one making the grid harder to destroy. In fact, some of my earliest card designs were meant to stop grid destruction, but that was before my research revealed the importance of slicing. HPG made an exclusive card for each of the conventions they were vending at. The set you linked, and its 2015 counterpart, are reprints of those cards. The original cards have expansion symbols that represent the con they are from. Don't get me wrong: grid destruction, or "slicing", as I call it, is VERY important in TSSSF, for the very reasons you mention. The flip side, though, is that the grid is a resource, and blowing it up constantly will hinder gameplay. I've mentioned slice a few times before in these forums, but it's so important that I'm probably going to dedicate a whole design article to it. I'm surprised to hear that you feel like you don't have enough slicers in your deck, seeing as how you have all the official cards, like Aria, Wild Fire, Jumpin' Jack, 4 Love Poisons, etc. Check out our card database to see if there are any fan cards that you would want to add to your deck (especially Mix Master Magic). On the subject on grid size, I've noticed that in my games the grid gets nuked at around 20 Pony cards. I will be both of those things! Side Note: I'm still on the hunt for an original Queen Bee Sunset Shimmer card, so if you have one and you want to trade or sell it, maybe we can make a deal! 1) The reason Shipwrecker was its own card type was to get child characters into the game WITHOUT putting them in adult situations. 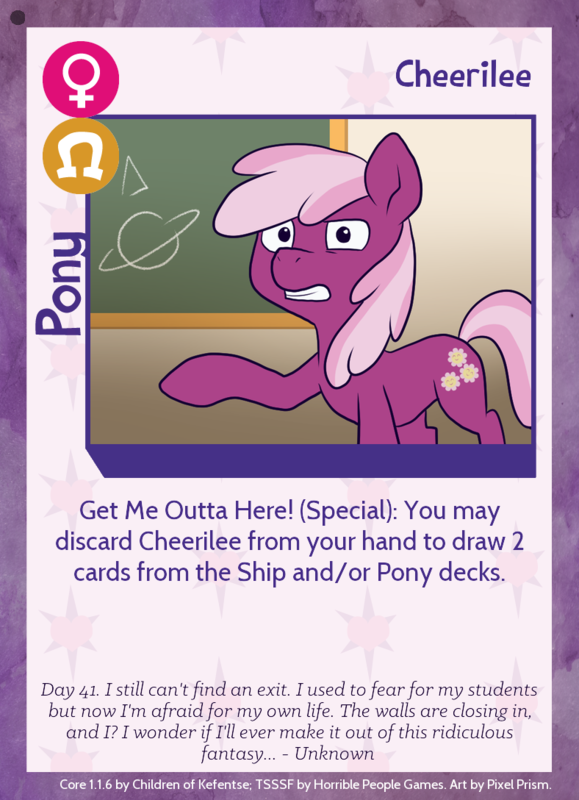 The alternative is to age up the characters as with Tales of Ponyville University, or put them on non-character cards as with Cutie Mark Crusader: Matchmakers! 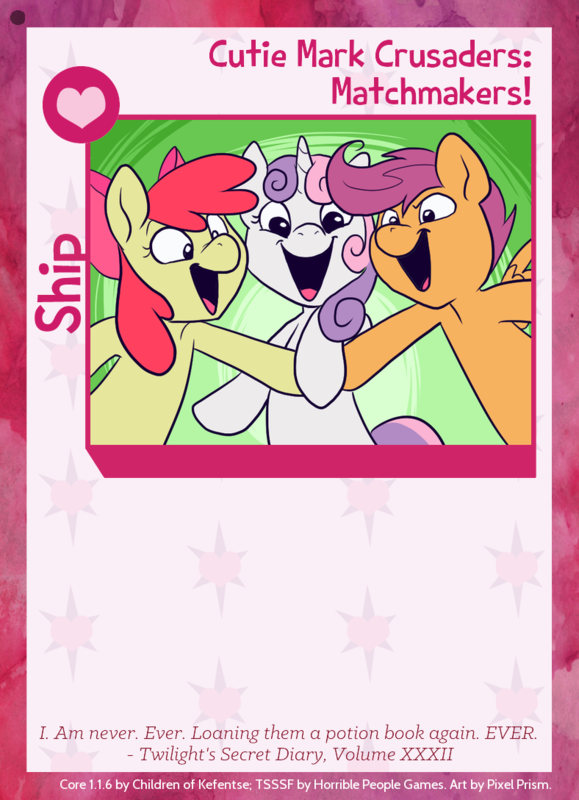 If you're going to redo the Shipwreckers as Pony cards, the characters portrayed must be 18+. 2) You are correct: Copy, like all powers that doesn't say otherwise, activates on the grid (Style Guide 2.6.10), by which point it is useless to copy Replace. I once asked the same question of HPG: They said they kept getting asked if Copy could copy Replace, so that's why the text is there. 3) Maybe Cheerilee's wording is more to your liking. 4) A valid concern. Also, Changelings could trigger this power if it's name-based. I'm still not a fan of this mechanic. It's just too easy to destroy the grid (think of much Cheerilee, who's power is activated the same way, gets recurred). Nah, it's fine. I'm sure someone else will be asking the same question at some point. We're trying to keep the database PG-ish, so we left that one out (and some others, see the Change Log tab). Also, why did you call the set "Going Too Far"? The official set name was No Holds Barred, and the version sold at cons WITHOUT Murder Turns Me On was called Some Holds Barred, and HPG informally referred to it as IGG or IndiGoGo. I don't get it. I thought you were looking for unused, complete art? Also, a couple of these are in the database. The card says "any Pony", which refers one specific Pony, so you are correct. I remember this question being answered by HPG at some point, and the artwork hints at how to achieve this Goal. Your friend would have a stronger case if it had said "Twilight Sparkle is shipped with 6 Ponies," but even then the intention is one specific Twilight Sparkle.